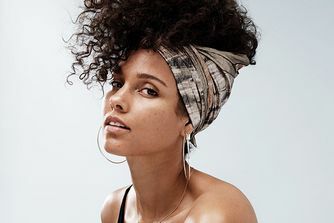 Stars like Maggie Gyllenhaal & Rosie Huntington-Whitely love MV Organic Skincare and it's also hugely popular with professional make-up artists, who love the efficacy of the products & the fact they contain high-quality essential oils. Bulgarian Rose Otto is a phenomenal hero ingredient throughout this range, strengthening, hydrating and balancing skins of all ages. 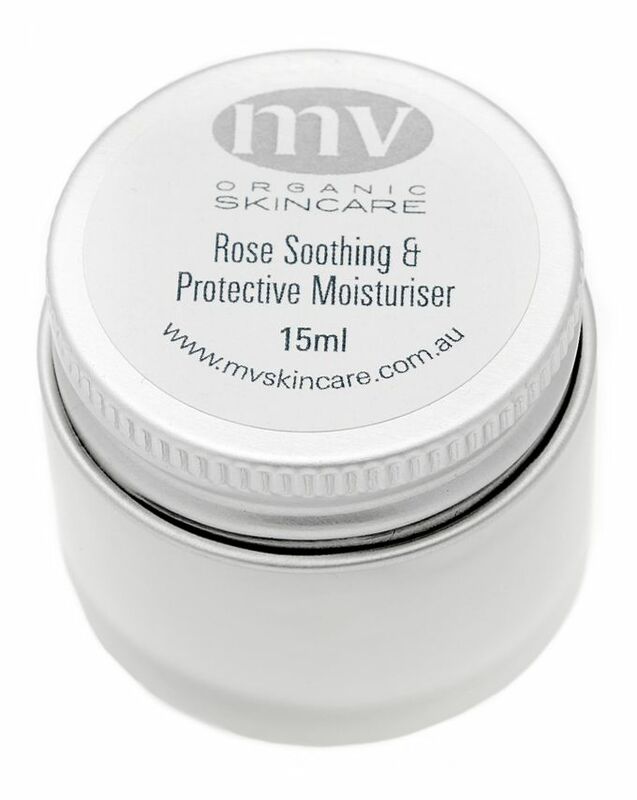 The Rose Soothing & Protecting Moisturiser smells divine and is miraculous for sensitive skin types because it calms irritation and feeds and balances the natural flora and fauna of your skin making it glow like you just fell in love. 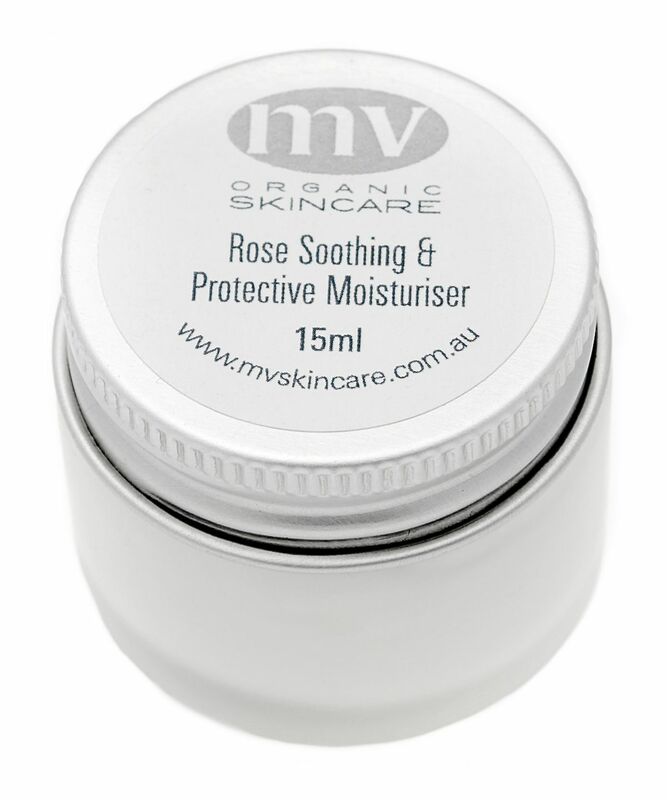 Perfect for the most sensitive skin and even if you have rosacea or eczema, this gorgeous moisturiser contains rose and rose geranium essential oils and non-GM Vitamin E. It can be used as a day or night cream and sinks in beautifully to create the perfect canvas for make-up. Mix with the Rose Hydrating Mist to lighten the formula if you have combination skin or the Rose Skin Plus Booster for extra moisture. The 15ml pot makes a wonderful travelling companion too. First cleanse, spritz with Rose Hydrating Mist, then spread half a pump of moisturiser over both palms and - while the skin is still damp - smooth over your face and neck. Great for sensitive skin. Needs to be mixed with the booster to make it moisturising. The first time I bought this is was AMAZING. So soft and gentle, I used it at night or when my sensitive skin got a bit inflamed. I couldn't wait to buy more. However, this batch? Weirdly it feels more claggy and doesn't absorb in the same way. Assuming because they make it in small batches but doesn't get 5* because of the inconsistency! Not sure if I'd buy again. The cream itself is very thick, but the cream is not as moisturising as it looks. It was quite nice after applying, but my cheek got dry quite quickly afterwards. And actually, them both great. I ordered the oxygen by mistake, and I used it for a few weeks. It’s a nice cream, but I prefer the Rose one, because it’s more gentle, and I have sensitive skin. I have tried every moisturiser under the sun, from budget to very high end. This is the only one where I immediately fell in love with it and nothing has ever compared to it. I have read lots of people do not like its scent but I personally love it, it's all natural and to be honest I am a very stressed person and find the scent quite relaxing and aromatic. It's not a chemical scent that you get with most creams it is like beautiful essential oil. Which from reading its ingredients makes sense. Anyway, my skin has never looked so nice and dewy. It absorbs well so makeup goes on nicely after and does not slide off or leave a sheen on your face of goo. It's just perfect. This will probably be my forever moisturizer. I absolutely love it. its thick and hydrating and absorbs really quickly. I have an often oily T zone with very sensitive dry skin around my mouth, and the rest is normal. My skin looks bright and smooth and I love it. This is a thick, and seemingly nourishing and soothing cream. Too thick and not moisturising enough for my dry skin. Would be best used on oily skin, or with some serious hydrating serum underneath because it didn't hydrate or moisturise. Instead it provides a layer or coating of cream that dried down to a matte like finish. This cream does wonders to my skin. I use it as a night treatment and I noticed that my skin is much smoother and clear. But there's one thing about this product that I really hate is the smell (I'm super sensitive to smells). I don't really understand why there is so many positive reviews on this one, I felt like it didn't work at all, a matter of fact it made things worse. I have a little bit of sensitive skin, but not very severe, just a little bit. For example I can handle most enzyme peelings as well as ordinary scrubs. However, this caused redness on my face, and it didn't sink in very well in the skin, rather it sat on top of it. Despite this it didn't even moisturize the skin very well, my dry to normal combination skin just felt, well, dry, it wasn't enough. Can't imagine it would work on really dry skin. I eventually gave it to my sister when I had tried it for quite a while and never noticed any improvements, she experienced the same thing. I was really looking forward to trying this product, both because of the excellent reviews and the clean ingredients (I only use products which have clean and toxic free ingredients list). I like the idea of this product but I must say that I was very disappointed in this, I expected more. Smells lovely, but where's the rest of it. I've struggled to find a good moisturiser for my combo skin. This moisturiser smells divine, it's quiet heavy but definitely does the trick of achieving a nice healthy glow. I use it every other night as a night cream due to how heavy it is and that I'm prone to spots. There isn't a lot of it for the price that it is, but it definitely feels like a good quality moisturiser that won't let u down on those dull dry days. One of the best facial moisturizers for sure. This cream has a very unique texture. It's rich but it has a matte finish. The smell is sweet, which I feel is more from rose damascena... it is very soothing and nourishing for my skin. I love using it underneath my makeup or as a night treatment. I hesitated because of the price but it's well worth it!!! I have sensitive, combination, dehydrated skin in autumn/winter (asian skin doesn't like belgian weather). It's rich but not heavy (no "plastic bag" sensation) and doesn't have shea butter in it, which can clog my pores. You can lighten its texture with rosewater, depending on the weather. I like to use organic rosehip or jojoba oil underneath and it works well! It smells like fresh roses and the packaging is handy to travel with. Thumbs up!!! For reference, I have normal to dry/sensitive skin and live in a tropical climate. I use this only in the mornings and after spritzing the Rose Hydrating Mist and I quickly massage a tiny bit (I find that if I use too much, my skin feels too matte) into the skin while the skin is still damp. After it dries down there is a slightly taut feeling for a couple of minutes but it goes away afterwards. It calms the redness in my skin (my main problem) and works well under makeup. The addition of this product, in combination with the cleanser to my routine had saved my skin from the bad reaction to a new serum I'd used. If you have problems with redness, please give this range a shot! Very nuce product for my combination skin prone to breakouts. I love the semi matte finish. I am normally quite fickle when it comes to moisturisers and have never found quite the right one for my normal/combination skin. I purchased the smaller size so I could try it first and have just purchased the large size along with the Rose Hydrating Mist. A little goes a long way with this product, it feels heavy but once applied leaves a beautiful soft finish that makeup applies like a dream over. It is super calming, the scent is lovely and my skin just loves it. I have not had one breakout since using this, and I am normally prone to them along with hormonal acne. 100% recommend, even if you just try the small size first! This is the best cream that I've used, it calms my sensitive skin, so incredible. This is a very gentle moisturizer esp. for sensitive skin. However, it is quite expensive for the amount of volume in the bottle. A rich albeit ridiculously overpriced cream with amazing rose smell. Very moisturizing so I only use it at night. This is great stuff especially for those with sensitive/ angry skin. It smells lovely and applies beautifully and is great underneath makeup. The only downside is the price for the quantity. However, I tend to use this more in the winter and its my saviour post breakout/ bad reaction to a new product as it really helps calm my skin. Great moisturiser for the winter mainly, the only one that hydrates dehydrated skin. Soothing for acne as well. Cannot be used in hot climates because it is really thick as a cream, amazing for the winter but maybe too much for the summer. I suffer from a patch of eczema above my lips and nothing seems to get rid of it. I read reviews about this moisturiser and how it works wonders for eczema. I bought it with high expectations; alas the eczema has not budged. This cream does have a hefty price tag but it will last you AGES. There's no way you'd finish this by the 'use by' date using it only during the day but I use it twice a day anyway. It's been 3 months and it seems that there's still half a bottle left. I have combination skin prone to breakouts and sensitivity and this is indeed quite 'balancing'. I have read comments complaining that this is too matte, it's definitely not matte; at first it feels like this but give it a few minutes and skin feels so nourished and soft but not too soft that it feels like nothing's there. It is a bit of a faff to have to dilute this cream with rose water but that's also a good thing because it makes this cream suitable for all skin types. When I first applied this ever I thought it irritated my skin, my skin was in poor condition but with continued use and a good cleanser I feel like my skin is healthier and can handle other products better. Of course if I eat badly I'll break out, but this soothes it while I go in with more purifying cleansers. A very unique product indeed. I tend to be quite a lazy person, so my writing this review should already imply how awesome it is! I have a dry skin which occasionally gets angry and bumpy, besides that I suffer from chronic atopic dermatitis and eczema on my neck and forehead (to the point it bleeds!). Whenever I have a bump or anything, after it's gone the redness and pigmentation linger for another few months. This cream is divine, I'd found the one (and I tried enough face creams). It's rich and nourishing yet never greasy (the finish is actually pretty matte, so it goes beautifully before applying make up), smells incredible, absorbs super quickly and most importantly helps with all my skin issues. I am truly happy! Buy this and you won't regret it. Whilst this is not my everyday moisturiser (meaning the 15ml is perfect to have on standby) - This is most definitely my 'go-to' product on those random days when shaving (for no particular reason) leaves my face 'scarred', red and irritated. As the name suggests - it really does soothe and helps to calm down the irritation and redness almost instantly. A fantastic product and worthy of all the praise! One of the best moisturizers ever. Just love the smell and how it is absorbed leaving the skin smooth and not greasy. THE best intensive moisturiser I have ever used. As someone whose skin seems to have a personality disorder (sometimes oily, sometimes dry, always super sensitive), I've struggled to find moisturisers that give enough hydration without irritating my skin. But this is incredible. The first thing I noticed was the scent; the rose extract smells like Turkish Delight. I put it on before bed; it's thick and velvety, but doesn't feel too heavy on my skin. I cannot describe the improvement in my skin after just a few nights; it's soft (we're talking baby soft), glowy without being shiny and my pores seem to have magically disappeared. No dry spots, no excess oil - this moisturiser is 'the one' and is worth every penny. I'll admit to being surprised by how much I loved this moisturiser. Velvety cream with rose oil that leaves skin soft with a perfectly matte base for make-up. On first application I was very impressed as to the feel and amazing aroma of the moisturiser. Before Christmas I started using it at night having washed my face with their cleanser. A month later everyone was commenting on how wonderful and glowing my skin was. Even the security guy at work stopped me to tell me how well I was looking and how radiant my skin was! Suffice to say that it wasn't a come on as so many others had commented. I'm very pleased indeed. I've been using this moisturiser for years. I have combination sensitive skin and so need something that gives me moisture on dry patches but doesn't congest my skin. This cream gives a lovely matte finish and quickly sinks into the skin. I do need more serums and extra products to go with it now I'm getting older but I would never switch from this moisturiser. I think it's a bit expensive though hence only 4 stars not 5. 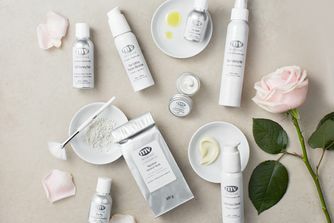 I love MV as a brand and the fact that they are cruelty-free and vegan. I also like the hygienic packaging and the smell of the cream. However, after a few days of using it (as instructed, only in the am after a mist), I broke out in a few AWFUL, super red and painful cystic pimples, 2 of which are still healing after 3 weeks. It left me with a few red scars. I very rarely break out, and my skin is is dry and sensitive. So, it is a nice product from a great brand, but be careful if you are prone to breakouts! I love products with a rose in but was really disappointed with this. It's quite thick and greasy, which in turn made my skin greasy. I think there are better things out there - try the Caudalie range for lighter brighter products that aren't as heavy. I travel often and have quite sensitive skin. This relieves any dehydration from flying. When I mix it with the Instant Revival Booster my skin glows and people will remark on how healthy I look. I bought this moisturiser in hope it would be what i needed for my dry sensitive skin. Being winter I needed something a bit thicker and rich. I found this didn't do the job for my skin unfortunately. After applying 20 mins later my skin feels tight and dry. I used creme de la mer before this, and i find that it is much better. so will revert back to that. I was looking for a moisturiser as an alternative to the Eve Lom TLC Radiant Cream and Cult Beauty team suggested this. It works really well, has a soothing smell, makes my skin soft and it absorbs quickly. It has a mascarpone-like texture but it isn't sticky or tacky at all. Will definitely repurchase. For how much it is you get so little product. I bought this because it had good reviews and thought it'd be good for combination skin, but it just leaves parts of my face in dry patches. Unfortunately this moisturizer isn't for me. I got a lot of little whiteheads on my cheeks. I kept using it hoping this would stop (or was caused by another product), but after 4 weeks of unhappy skin I admitted defeat. My skin went back to normal pretty soon after, luckily. Love this it really helped through the initial raw phase of retinol peeling. It's so beautiful and moisturising that I can't believe that it's all natural! Texture - The finish is so velvety and it leaves my acne prone/dry skin perfectly moisturised and nourished. Effect - My skin significantly calmed down after I started using this. I was experiencing a bad bout of cystic acne that just kept coming up one right after the other. After starting use, after 2 weeks, my skin is now completely clear, and most of the acne scars have healed well so that now there is only slight pigmentation left! Price/cost - Yes it is expensive but a little really goes a long way - I use maybe half a pea-size every time. I will definitely be purchasing the full size when I eventually finish my 15ml! I have tossed out everything toxic out and received this sample with other non toxic items. I have dry sensitive skin as I have gotten older. I am in my early 30's and most moisterizer would sit on the surface of my skin and become greasy and quite heavy. This product is light and feels hydrating under my makeup. I usually get greasy in my t-zone, but with this I don't!! I really, truly wanted to love this product. I'd had it on my wishlist for months and read all the rave reviews about how it makes your skin perfect. I really loved the fragrance of it and the feel, but this moisturiser clogged every. single. pore in my skin and caused terrible breakouts on my chin. I have acne-prone skin but it's usually only one spot here or there every month, and nothing like this. My dermatologist was shocked. Unfortunately, I do not recommend this moisturiser. I have very acne prone and somewhat oily skin that is also very sensitive. This stuff really calms down any redness and works like a dream under foundation. I also put a bit extra on hormonal spots, and this really calms them down. I love the simplicity of this, as most moisturizers with dozens of ingredients sting when first applied on my skin. This looked and felt way too rich for my skin at first glance, but it spreads out very thin and leaves no oiliness at all. My skin feels calm all day with this on, and I get hardly any oily spots. Some reviewers think it is too expensive for the amount you get, but I need very little for my skin to feel moisturized. I've had the 15ml for a few months and I can't even see the bottom of the jar yet. Quite good quality for money considering I used to use globs of many other moisturizers to feel moisturized throughout the day. Finally, the rose smell is amazing for not being an artificial fragrance. Perfect for my combination skin. It took me a few uses to get start loving the consistency, but now my skin protests if I switch to another moisturiser. Leaves a matte finish. I'm on my fourth bottle now. Love it. I bought a sample size pot to try and loved how effective it is (and the amazing scent - perfect if you love the smell of roses!). I have very dry and sensitive skin, and this moisturiser was perfect to bring my skin back up to its normal hydration levels. However, it may be a bit heavy for use during summer and probably should be bought together with the Rose Hydrating Mist to make it easier to spread across your face evenly. I'm going against the flow here. After all the good reviews I was hopping to like this but I found it to be too matte for me. If you are oily this might be heaven, probably why so many good reviews. Amazing cream! I apply this after cleansing in the morning and it leaves my skin so moisturised and soft. Since using this cream I have noticed an improvement in my skin- no spots! The redness around my cheeks have drastically reduced. The best cream I've tried! I had major breakouts that lasted for months, before seeking advice from my GP I tried the MV range including this moisturiser.. It cleared up within 2 weeks and my skin has never looked better. im not crazy about the smell but it definitely works. I will definitely be trying more of the range. I was afraid at first when I got this cream: the texture seemed too thick once you put the cream on the face. But it absorbs really quickly, leaving your face non greasy and well hydrated. I use it together with the Rose booster and I love how my skin looks and feels. I even stopped using my foundation (during summer months). Anyway, the MV range is absolutely fantastic, I can't recommend it enough! At first this moisturiser seemed a bit strange to me: the texture is very thick and you can feel the oils in it. But then I figured out that, if put over damp skin (you can spritz it before with their mist) or mixed with some toner, it applies beautifully and sinks in quickly leaving almost a matte finish! It's so calming and nourishing and does not clog my pores (I have sensitive, prone to breakouts skin). Love it! I read so many reviews by beauty bloggers about this one that I had to try it. I got the travel size and already know I will be repurchasing the full size. I use this with the MV facial mist and it keeps my dry skin hydrated all day, but not greasy. My Jouer and By Terry foundations apply beautifully on top too! I am quite fussy about moisturisers and usually don't like to pay quite so much for one, but this one is worth it and will be my go-to from now on! I've been using Paulas Choice Resist skincare range with great results for a long, long time, but wanted to try something more natural and organic. I've used both the cleanser and the moisturiser for some time now, but it's not for me. It clogs up my pores like crazy and for the time I've been using it, my skin has broken out real bad on my forehead and chin. The feel of this moisturiser i very velvety on the skin, but it absorbs to quickly. it's just not moisturising enough for me. It makes my skin feeling tight and makeup seems to cling to the dry patches on my face. The smell is ok, not great. Going back to Paulas Choice. This moisturizer seems to have some magical ingredient. Not only does it moisturize beautifully, it balances the skin and even made a big spot on my chin disappear over night! I have never had a cream that could do that. Amazing! After years and years of problem skin I can finally say hello to baby skin. Love it! This is the one product that started my MV addiction. Nourishing without being greasy, this fab moisturiser soothes my skin like no other. The smell is a luxurious and sophisticated true rose scent that makes application simply dreamy. For a lighter lotion, use half a pump of the moisturiser and add a spritz of the MV Rose Hydrating Mist. If you fancy a bit more of a pamper, blend half a pump of the moisturiser with a spritz of the hydrating mist and add a couple of drops of the MV Rose Plus Booster. Glowing and plump skin guaranteed the day after. Incredible product, love its versatility. I have very dry, dehydrated skin, and have tried everything to keep it flake-free. No matter what high end oil or moisturizer I use, I always have dry patches by the end of the day. This is the first cream I remember using that is thick but actually absorbs well into the skin and keeps is extremely well hydrated. Love the whole range. Obsessed with this. Don't love the smell personally, but many people do. I have really sensitive skin and this moisturiser actually lives up to its promise. My search is over for the perfect moisturiser, plus it smells amazing. I love to use it just before applying my make-up, its the best make-up primer! !